The Key (あのカギ?, lit. : "The Key") is a treasure in Pikmin 2, whose name is the only one among the treasures that describes itself exactly. It is quite obviously a large, golden key. The Key is found inside the body of a Beady Long Legs on the last sublevel (5) of the Citadel of Spiders. Besides increasing the Poko total, The Key also unlocks Challenge Mode, which can be found in the main menu after the treasure has been collected. It is the only part of the Explorer's Friend Series that is not found in the Exploration Kit. In Pikmin 2's Challenge Mode, this treasure is found on every sublevel of every one of the 30 levels. It is required to make the entrance to the next sublevel – or a geyser – appear, and is worth 100 Pokos. “Sweet victory! That giant insect's body has crumbled to dust! I am quite relieved to know I won't have to store such an enormous bug. ... ... ... ...Anomaly detected. This object seems familiar. I will combine it with the president's parallel-dimension controller. ALERT!!! Sensors indicates a massive dimensional shift at a distant location. "Challenge mode can now be accessed from the title screen." It appears to be a total gibberish. Hopefully the message has reached its intended recipient. The Key in its cutscene. The key lying on the floor. A key from Super Mario World. 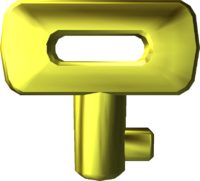 The Key bears a striking resemblance to the keys in Super Mario Bros. 2, which were guarded by Phanto masks, or the keys in Super Mario World, which opened keyholes leading to secret stages. Perhaps erroneously, Olimar calls the Beady Long Legs a "Pikmin-devouring spider", even though the creature does not eat Pikmin. Two unused upgrades in Pikmin 3 feature The Key on a pedestal. This page was last edited on January 10, 2019, at 16:59.